“freely distributed, modified, or copied” and “is not commercially distributed” How can this be not contradictory? None of the approved Open Source Licenses prohibits commercial distribution. Not even Microsoft’s open source licenses. So, There isn’t any open source license that can benefit from this “Patent Pledge for Open Source Developers”. It’s useless! And I can’t believe anyone, besides Novell and Miguel de Icaza, be stupid enough or irresponsible enough to accept that pledge. Put further restrictions on how can we redistribute invalidates that licenses. Then we see how a open source license is useless, unless it specifically addresses Patents. That’s is why saying Mono/Moonlight is open source is meaningless. If we have to seek patent protection from a specific company (a third company) to use and distribute, then the Freedoms that license provides us don’t mean anything. That’s why GPL3 is so important! Ask yourself, why is that none of Mono/Moonlight software is release as GPL3. 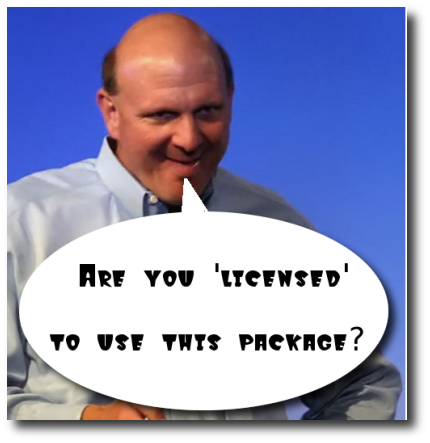 Why is that the core Mono software is released as MIT license? Why is so little C# open source based software is released as GPL? Why is that Icaza is so ambiguous about licensing matters surrounding Mono/Moonlight? Saying that the software is “Free Software” and at the same time saying that people wanting to use and distribute it should either/or get it from Novell or get a patent protection from Microsoft? Perhaps he should called “Fee Software”. Why is that Icaza says one the advantages of Moonlight/Silverlight over Flash is that is Open Source and then to use it we have get the CODECs from Microsoft? Video without the CODECs to play it is useless. So what’s the point? Is there really any improvement over Flash? Microsoft is reframing what is and what is not “Free Software”/”Open Source” and Miguel de Icaza and his followers (someone compares this to a religion; I’m starting to see it that way too) is helping them achieve that. It’s disgraceful. What is the point of having something called Open Source if we don’t have any of the Freedoms associated with that? I had a chuckle at “Fee software”. Mind if I borrow the term?